(Sterling, VA) -- Delegate Tom Rust announced a Town Hall Meeting on Gang Violence to be held in Sterling. Rust will be joined by Congressman Frank Wolf, Board of Supervisors Chairman Scott York and Supervisor Eugene Delgaudio in discussing state, local and federal efforts to combat gang violence. "After speaking with many residents of Sterling, it is clear that people would like more information about what steps have been taken to stop criminal gangs," said Rust. "I hope this will serve as an opportunity for the public to find out more about the steps their government is taking to combat gang violence, and to give their representatives feedback. I am especially appreciative of Congressman Wolf, Chairman York and Supervisor Delgaudio for participating in this meeting." For more information, please call (703) 437-9400 or email trust@tomrust.org. This morning National Review Online published an excellent story about Ken Cuccinelli. It highlights his committment to the founding fathers, his belief in core Republican principles, and grassroots support. June 29, 2009, 4:00 a.m.
A prospective state attorney general goes back to the founders. Several prints of war paintings hang in the law offices of Virginia state senator Ken Cuccinelli, but the most prominent is titled Sons of Erin: It shows a brigade of Irish-born Union soldiers charging into the Battle of Antietam — or Sharpsburg, as it’s known in Dixie. The Irish brigade, comprised of poor immigrants — many fresh off the boat — lost over 500 men that day. “The Irish were the best fighters on both sides of the war,” says Cuccinelli, a self-described Civil War buff who is half-Irish himself. Cuccinelli is running for attorney general as a conservative Republican in a right-leaning state that’s having a fling with Democrats. Last year, voters delivered their electoral votes to Barack Obama. Virginia’s governor is a Democrat and so are its two senators. Perhaps this trend makes Cuccinelli an underdog, like those Antietam warriors and their ancestors back in Ireland. The candidate certainly sees it that way, except in one important respect: “They always lose,” he says. So far, the 40-year-old Cuccinelli has always won. In 2002, he ran in a special election to represent Fairfax County in Virginia’s senate. He won again a year later. Then, in 2007 — a rotten year for Republicans — he had his toughest race yet, winning by about 100 votes in a race that required a recount. He expects a close election this November, too, against Democratic state delegate Steve Shannon. Cuccinelli becomes most animated when he’s talking about the philosophy behind the principles. He cites the Declaration of Independence’s most famous line, about the self-evident truths that “all men are created equal, that they are endowed by their Creator with certain unalienable Rights,” including life, liberty, and the pursuit of happiness. Then he makes an important observation: “Most people forget the next phrase, which explains that it is for these purposes that governments are created.” Cuccinelli considers this phrase — “That, to secure these rights, Governments are instituted among Men” — the key to understanding what the founders were thinking: Rights are inherent and universal, and governments exist only to guarantee them, not to grant them. In the contest against Shannon, Cuccinelli will need more than a good reading list. “We have a significant grassroots advantage,” he says. “We know grassroots better than anyone else, and we’re more focused on that.” He claims his strategy of knocking on doors gave him the small margin of victory in 2007. This approach won’t work as well statewide, though he plans to repeat the practice as much as possible and encourage his volunteers to do the same. — Michael Warren, a Collegiate Network intern at National Review, studies economics and history at Vanderbilt University. Tertium Quids has some very interesting analysis of the profile. I know money isn't plentiful, that is just how it is with the current economic situation. However, Ken has a critical fundraising deadline coming up, and even if you can just donate $5.00 please do it. I strong showing in this fundraising quarter will give the campaign momentum, and the campaign needs money anyways. Ken explained the importance of your donation in today's Cuccinelli Compass. We have our first post-convention fundraising period ending tomorrow at midnight -- and we MUST have a strong showing. Our challenger, Steve Shannon, ran unopposed for the Democrat primary, and as a consequence has been stockpiling money for over a year now. With just one month since we won the convention, I need your support to help us play catch-up! While Steve Shannon was stockpiling cash, I was driving around the Commonwealth meeting with Virginians and building a grassroots network of volunteers and supporters. We are miles ahead in our grassroots organization, but now I need your support to help us close the financial gap. You can help us show a strong report by donating to our campaign before midnight tomorrow night, June 30th. And remember, it doesn't matter if you give $5 or $500. It all helps tremendously, so please give what you can. Thank you and see you on the campaign trail! Recently Obama began pushing the UN Convention on the Rights of the Child. In light of this fact I have been exploring different things this treaty will do to America if we enter into it. The U.S. Congress has a tendency to pass legislation without fully understanding what they are passing. I want to make sure this does not happen with the UN CRC. One thing this treaty will do is undermine our own military. It does it in two ways: restricting army recruiters access to highschools, and limiting the amount of money America can spend on national defense. In California the UN CRC is being used to keep military recruiters out of highschools because they are encouraging people under 18 to join the military. While the courts have yet to decide on this issue, it is frightening to see how international law is being used to trump federal law once again. When it comes to military defense, the treaty expects everyone to agree with the notion that protecting children is the most important thing a nation can do. One application is the idea that if you aren't spending enough on your children as a nation you are clearly not protecting them. National children’s health insurance and other social programs would be created in order to comply with the CRC. The U.S. would have to curtail defense spending in order to keep in proportion with these social expenses. To a western European country whose defense our military has subsidized for decades, this would have no major impact. But the effect would be devastating to both our economy and our security. If you want to yield national sovereignty to an international body support the UN CRC, if you don't please contact your senator and the whitehouse and ask them to oppose passage of this treaty. Cuccinelli's General Election Literature Raises Reagan's "Banner of Bold Colors"
While there has been some concern in this election about candidates who almost seem ashamed of their conservativism, Ken Cuccinelli's general election literature doesn't stir up that fear. Throughout the nomination contest Ken talked about how candidates tend to paint themselves as conservatives in a nomination fight just to win the contest. Ken's literature piece let's everyone know he is not one of those people. "Many politicians forget where they draw their authority--from you the people. Government has an obligation to be transparent and to maintain as limited a place in our lives and businesses as possible while protecting our communities. These are beliefs I will carry with me to the state capitol." Ken continues by laying out specific things he will do as Attorney General. This list of goals includes "expanding opportunity by resisting the growth of government and keeping Virginia a low regulation... state," "preserving property rights and the Constitution--as it is written," and "advancing openness and accountability to give the citizens of Virginia better control over their own government." Thes are all distinctly conservative approaches to government, and I think ones that resonate well with a lot of people. I applaud Ken Cuccinelli for being willing to run as a conservative in a statewide general election. Ken Cuccinelli's new literature raises the "banner of bold colors" Ronald Reagan encouraged Republicans to raise, and I am proud and excited to stand with Ken Cuccinelli. If you would like to help spread Ken's conservative message across this state, please contact a local victory center and volunteer, or donate to Ken Cuccinelli. Here is a photo of the literature piece I described in this post. This afternoon following the passage of cap and trade Randy Forbes sent out an e-mail with his thoughts on the bill. Randy Forbes offered his New Manhattan Project as an alternative to the bill. Last night as many Americans began their weekend, the US House of Representatives was voting to saddle them and their families with a large additional tax burden through legislation, known as the cap-and-trade national energy tax. The effects of this tax will be far reaching. It will impact American families in all parts of their daily lives – when they turn on a light switch, watch TV, mow their lawn, or run their dishwasher. Over the course of a year, the average family of four will see their energy costs rise by $1,200. Electric bills will rise by $754 per year and gasoline costs will rise by $596 per year. All total, an average family will to have to find an additional $100 in their monthly budgets to cover this new national energy tax - which is on top of the taxes already paid on energy bills. This is wrong – especially now when so many have lost jobs and are just trying to make ends meet. I need your help as I continue to try to stop this burden on our families. Businesses will feel the staggering cost of this legislation as well. Farmers and manufactures will be among those hardest hit. All total, the National Black Chamber of Commerce estimates this legislation will cost 2.5 million American jobs. Other estimates suggest anywhere between 1.8 and 7 million net American jobs could be lost. Many of these jobs will be shipped overseas. American businesses will face declining competitiveness as they struggle to compete with foreign companies whose products are not subject to this tax. As the Wall Street Journal noted "Even as Democrats have promised that this cap-and-trade legislation won't pinch wallets, behind the scenes they've acknowledged the energy price tsunami that is coming. During the brief few days in which the bill was debated in the House Energy Committee, Republicans offered three amendments: one to suspend the program if gas hit $5 a gallon; one to suspend the program if electricity prices rose 10% over 2009; and one to suspend the program if unemployment rates hit 15%. Democrats defeated all of them." Any glimmers of economic recovery in our recession are likely to be threatened by this new tax. Under this bill, already-strapped small businesses will face skyrocketing energy costs and will have less money to retain their current employees let alone create new jobs. Sadly, even if one could overlook the crushing results of this bill on our economy, the legislation does not even meet its intended purpose. As the Washington Post reported yesterday, even environmental groups such as Greenpeace and Friends of the Earth oppose the bill saying it will not help our environment. Last night I took to the floor and fought strongly against the passage of this national energy tax. I even introduced my widely-acclaimed New Manhattan Project for Energy Independence as an alternative. My bill would spur green energy innovation without raising taxes. The majority of my colleagues chose taxation, rather than innovation. My constituents, however, overwhelmingly supported my position and my alternative to the national energy tax. Supportive emails and phone calls poured in my office all day. The sad reality is that there are too few of us fighting to lower taxes and bring innovative bipartisan ideas before Congress. There are too few of us fighting against big government. There are too few of us fighting to preserve the individual freedom and liberties on which this great nation was founded. And those of us left will very likely face opponents next campaign year. I am writing to you today because I need your help to stay in Congress and to be your voice in Washington. This year, my campaign must rebuild our financial footing. If you believe in what I am doing in Congress would you please help us to do that? Would you consider donating $20 to my campaign today? If you could do more, I would appreciate it. If you can only afford $10 now, I want you to know that your contribution makes a difference. Please also consider a monthly donation of $10 or $20. Individuals that give on a monthly basis form a powerful financial base for my campaign. The cap-and-trade national energy tax must now be considered in the Senate. I’ll continue to fight against it and the tide of bailouts, runaway spending, and taxation in Washington. Let's hope we can stop this terrible bill. PS – The list of organizations opposed to the cap-and-trade national energy tax was staggering. Below is just a partial list. Would you forward this email to a friend that is a member of one of these organizations – or post this email on your Facebook page via the link below? Please let your concerned friends know of my position, of your support for me, and ask them to also support my campaign. We need your help. Political contributions are not deductible for federal income tax purposes. Corporate contributions are prohibited. To comply with federal law we must use our best efforts to report the name, address, occupation and employer of individuals whose contributions exceed $200. Contributions from foreign nationals and minors are prohibited. An individual may contribute $4,800 ($2,400 primary, $2,400 general). Today during the debate in the House of Representatives on cap and trade, Bill Bolling sent out an e-mail stating his opposition to cap and trade. Good luck to him on trying to get Jody Wagner to oppose cap and trade. Last week, in response to a letter from American Solutions on the Waxman-Markey national energy tax (also known as "cap and trade"), Bill Bolling joined his running mate Bob McDonnell in opposition to massive new energy taxes on Virginia families and businesses. The people of Virginia deserve a Lieutenant Governor who will lead, and you can't lead by ducking the issues that matter most to Virginia. While Bill Bolling and Bob McDonnell have said "Yes" to More Energy, More Jobs for Virginians, Jody Wagner has said "No" to the development of Virginia's energy resources. By opposing nuclear power, clean coal and the development of Virginia's offshore energy resources, Jody Wagner is rejecting common sense, job-creating solutions to our energy crisis and siding with the extremist wing of her party in opposing our attempts to create a more prosperous Virginia. As far as the votes are concerned, while their was a lot of speculation over whether Tom Periello would vote against the bill, the only Virginia Democrat to vote against the bill was Glen Nye. Glen Nye simply voted no because he needed to get reelected. The Republican nominee to run against Glen Nye is Chuck Smith. He is a conservative African American Republican running for congress in the 2nd district and he has come out in opposition to using global warming as an excuse to raise taxes. The 2nd district is an example of the Democrats allowing Democrats to vote no to hel pin close elections. If you live in the 2nd district, don't let Nye fool you. Please elect a Chuck Smith a real conservative in 2010. Earlier I posted about John Boehner's courageous stand against the cap and trade bill. Sadly the bill passed 219-212. 44 Democrats voted against the bill, and 8 Republicans voted for it. Also Randy Forbes made an attempt to offer his New Manhattan Project bill as a substitute, but the Republicans could only muster about 172 votes. As a result of an obscure House Rule Boehner as majority leader is fillibustering on the house floor on the vote on the Cap and Trade bill. He is going page by page through the bill and explaining how and why it is the biggest government takeover ever. How you build your house, the materials you use, zoning, and even green banking centers is dictated by the bill. "When you file a 300 page Amendment at 3:09 AM, the AMERICAN PEOPLE have the RIGHT TO KNOW WHAT'S IN IT!" Earlier this week I explained how the Obama administration was beginning to push the UN Convention on the Rights of the Child. It is a dangerous international treaty that will strike a devastating blow at American sovereignty. Besides being used to undermine the ability to homeschool, the UN CRC will also undermine private gun ownership in America. Because the UN CRC is a self executing treaty, the UN interprets and applies it. People that advocate the UN CRC and its authors are clear that they believe gun ownership is dangerous for children. And now we learn one more aspect of this charming treaty: guns. Yes, guns. To put it bluntly, if you live in a community with children – and who doesn't? – you shouldn't have guns. Allegedly the CRC's justification is to keep kids from becoming child soldiers in third-world countries. No argument from me. Afghanistan could use some lessons in raising kids. But if the U.S. ratifies the CRC, then we must accept the UN's position to "believe, teach and promote the idea that all private gun ownership is dangerous for children, and children have the right to grow up in a community that is free from all guns" (emphasis added). In communities enjoying relative peace, children witness and are traumatized by the use of small arms and light weapons in domestic violence and in disputes. Children also become accidental victims because adults fail to keep the weapons out of their reach. Efforts must be ongoing to overcome the destructive messages that small arms and light weapons are essential instruments for survival and protection in daily life. Regulations are needed to ensure that small arms and light weapons are not easy to acquire and are never accessible to children. Second, the UN contends that the threat posed by guns violates the “human rights” of children." Please join us in making it clear to the senate and the Obama administration that we believe in gun rights, and the UN CRC should not be adopted. Recently Obama launched a trial balloon on the UN Convention on the Rights of the Child. I would like to take this opportunity to explore what the UN CRC will do if it is implemented. Probably the threat from the UN CRC that is nearest to my heart is the impact it will have on homeschooling. The whole thrust of the UN CRC is to in sure parents aren't forcing children to do things they don't want to do. Under this theory if a parent decides to homeschool their child, and the child is wholeheartedly for it, then the parents are in legal trouble. The UN CRC is already being interpreted in this way against homeschoolers in Britain. Britain might see homeschooling abolished as a result of the UN CRC. Last week the Children’s Secretary of Britain accepted a report in full by Graham Badman which argues for an end to homeschool freedom. “While it’s disgraceful that the British government would even entertain this report it’s particularly troubling for American parents because the United Nations Convention on the Rights of the Child (UNCRC) was used as the justification for this action,” said Michael Farris, Chairman of HSLDA and President of ParentalRights.org. I hope you will join me in opposing the UN CRC. Please take a moment to tell Obama and your senator to oppose the UN CRC. The U.S. Fourth Circuit Court of Appeals this afternoon upheld Virginia’s long sought ban on partial birth abortion. The law, passed in 2003, has been blocked by courts ever since. But today, we celebrate the Fourth Circuit’s decision! Honestly, I still have vivid memories of the courtroom last fall where this case was debated. Those of us who were there can remember the lawyer from the Center for Reproductive Rights arguing against the ban making her case that, should the Virginia statute as it currently reads be upheld as constitutional her client, a doctor who performs abortions, could potentially face prosecution. During the course of her explanation, she actually described a potential situation in which the doctor fully delivers the child, who is then separated from the mother, and placed on a nearby table to…“expire.” Not, die. Expire. Born alive, and left to die. The coldness of that statement and the complete lack of compassion for human beings in their most vulnerable stage were palpable in that room. These were people who were advocated for the killing of a child, a fully developed child just days from birth. Thank God the majority of the court rejected their argument. All pro-life Virginians owe a debt of gratitude to Delegate Bob Marshall (R-13, Manassas), the original patron of the legislation, for his passionate advocacy for the unborn on this issue, and to former Attorney General Bob McDonnell and his office for their skilled defense of the law throughout the process. Last night I posted how Obama was beginning to push the UN Convention on the Rights of the Child. Today Mike Farris encouraged everyone to contact Obama, Susan Rice, and their senators to express their opposition to the UN CRC. Monday in a Harlem middle school, U.S. Ambassador to the United Nations Susan Rice told a group of 120 students that administration officials are actively discussing “when and how it might be possible to join” (that is, ratify) the UN Convention on the Rights of the Child (CRC). As before, she also communicated what a disgrace it is that the U.S. would stand with only Somalia against such a widely-accepted treaty. In my 30 years of political involvement, I have learned to recognize this as what is called a “trial balloon.” Like in World War I trench warfare, our opponents have “sent up a balloon” to see if it will draw fire. If things remain quiet, they will proceed with their plans to push for ratification of the CRC in the U.S. Senate. 2. Call Ambassador Susan Rice’s office at the United Nations. Tell her that you want her to represent the United States to the world rather than trying to get the United States to go along with international law initiated by the UN. Her office number is 212-415-4000. Later on in the day an update was sent out on the progress of the attempt to derail the UN CRC. Please keep up the pressure and continue calling President Obama and your senators to express your support for parental rights and opposition for the UN CRC. In this video Mike Huckabee announces his support for Marco Rubio as he seeks the Republican nomination to replace Mel Martinez in the U.S. Senate. Mike Huckabee also issued a statement in which he was highly critical of the Republican establishment's support for Charlie "I love the bailout" Crist. “The establishment Republicans have made this endorsement for the same reason that they’re in so much trouble,” Huckabee said. “They go out there and support stuff like TARP bills and stimulus packages, pork-barrel spending and huge debt, and they wring their hands and act like, 'This is not good, but we don’t have a choice.' "
Today the US amabassador to the UN, Susan Rice, announced that the Obama administration would begin work on passing the UN Convention on the Rights of the Child. The Obama administration is reviving efforts to have the United States sign onto a global children's rights treaty ratified by every U.N. member except the U.S. and Somalia, the U.S. ambassador to the United Nations, Susan Rice, said Monday. Administration officials are actively discussing "when and how it might be possible to join," Rice, a Cabinet-level official, said while visiting a school in Harlem and fielding a teenager's specific question about the U.N. Convention on the Rights of the Child. This convention would undermine parental rights by providing a platform to emancipate children from the authority of their parents. Of course, parents will be expected to provide all the needs of their children…and all the wants of their children. If children want something, and the almighty state agrees they should have it, then the parents will have to dance. And if the parents feel the need to spank or otherwise strongly discipline an unruly child, the parent will quickly find that they are acriminal. They will quickly find that the child, and the child’s guardian (the state), are in charge in the home. Please call the White House comment line (202-456-1111) and your U.S. Senators (202-224-3121) and tell them that you support parental rights and oppose the UN Convention on the Rights of the Child. To find a detailed analysis of the UN Convention on the Rights of the Child, please check out this article by Michael Farris. The following video is Mike Huckabee's thoughts on the Iranian situation. In it he reminds us of the importance of standing strong in supporting the Iranian people, and opposing the dictatorship. Last week Bob McDonnell came under fire from the Washington Times for refusing to sign a pledge to not raise taxes. Yesterday his campaign released Bob McDonnell's record on taxes. It is quite an impressive record, and I hope Bob continues to remind people of that record throughout the campaign, and continues to cut taxes as governor. I will say as well that I like the tax cutting regulation cutting Bob better than the new green jobs version. Here is a video montage of Bob in his own words. Here are quotes from Bob on the issue. · McDonnell, who is unopposed for the Republican nomination, pointed out that unemployment is up and consumer confidence is at its lowest point in 30 years — not the time, he said, to place an additional financial burden on Virginia families. Rather than raising new revenue, McDonnell said, his administration would slash state government expenditures. “We have a spending problem more than we have a taxation problem,” McDonnell said. · McDonnell, in turn, said Deeds would be a poor steward to guide the state through a recession. "My philosophy is to keep taxes, regulation and litigation low," he said. "He set a record of doing something different." · "The worst thing you can do is to tax your way to prosperity,'' McDonnell said. "That's failed in the United States and abroad." · The former Virginia attorney general also said he would fight the rebirth of the “death tax” – an inheritance tax that was eliminated a few years ago. “The federal government wants to reinstate that, and we should do everything we can to make sure it doesn’t,” McDonnell said. Earlier this month, Obama declared June Lesbian Gay Bisexual and Transgender Pride Month. Last week he gave federal benefits to the partners of gay federal employess. Obama is using every opportunity available to advance the cause of the LGBT community and undermine the traditional family. Elections have consequences, and if we want our traditional values upheld, then we must get into the political arena and fight hard. Today was the first Attorney General debate of the general election. In the leadup to it, Steve Shannon wanted to limit the use of audio and video clips from the debate. I think Ken Cuccinelli's press release explains why. Cuccinelli answers questions, takes positions - Steve Shannon? Well, he was there. Candidates agree that debates are substantive for campaigning, agree to hold more. In the Commonwealth's first debate for the office of Attorney General hosted by the Virginia Bar Association, Republican Senator Ken Cuccinelli and Democrat Steve Shannon touched on a host of issues that demonstrated a wide difference in opinion and approach as to how they would operate as Attorney General. Cuccinelli made clear that he would support and defend Virginia's right to work laws, where Steve Shannon has a 100% voting record with the AFL-CIO. Shannon refused to take a position on "Cap and Trade" - an issue that the next Attorney General will have to deal with as Washington continues to encroach on States economic prerogatives. "I am pleased that Steve and I had this opportunity to debate on such a wide variety of topics said Senator Ken Cuccinelli. Virginians will be surprised to learn that not only will Steve Shannon not take positions on important issues but that if and when he does he will almost assuredly change them. Virginians need an Attorney General they can count on. As your next Attorney General I will interpret and defend the constitution and will remain consistent in my beliefs" added Cuccinelli. In a debate lasting a little over an hour, moderated by the Executive Director of the Sorensen Institute at the University of Virginia Bob Gibson, members of the Virginia State Bar and Virginia's current Attorney General Bill Mims could witness first hand Steve Shannon's unwillingness to state a position on any major issue. His refusal to answer a question on the pending 4th Circuit Court ruling on Partial Birth Abortion and changing (again) position on the marriage amendment is indicative of a man without any sense of direction. He most certainly will have to deal with these and many other questions as Attorney General, but his silence speaks volumes. 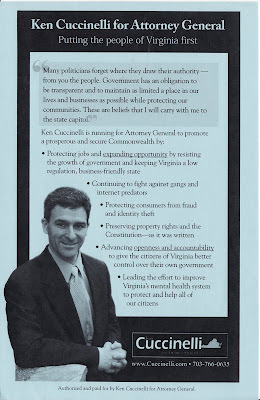 Senator Ken Cuccinelli was the only candidate to unveil any major policy initiatives that he would pursue as Attorney General. These proposals will be discussed in detail in the weeks ahead, but go to the core of the job of Attorney General. "The first, consolidating the office of Consumer Affairs under the office of Attorney General would streamline government, provide a clear line of authority for business and get consumers off the Merry-go-around of where to go to get help said Ken Cuccinelli. How much sense does it make to house part of consumer affairs in the Agriculture Department?" added Cuccinelli. The second policy initiative would make the Virginia Court of Appeals a middle level of appeal for all cases, unlike its current, very limited authority. "This will help bring consistent application to the law of Virginia, and will offer the chance for truly meritorious appeals that now do not get consideration because of the Supreme Court's workload limitations," said Senator Cuccinelli. "It's a change a long time in coming." In response to these statements, and President Obamas inactivity on this issue Rep. Mike Pence introduced a resolution that condemned Tehran's crackdown on protestors. While discussing the resolution, Mike Pence said, "When Ronald Reagan went before the Brandenburg Gate, he did not say Mr. (Mikhail) Gorbachev, that wall is none of our business." The Democrat Chairman of the House Foreign Affairs Committee and cosponsor of the resolution said, "It is not for us to decide who should run Iran, much less determine the real winner of the June 12 election. But we must reaffirm our strong belief that the Iranian people have a fundamental right to express their views about the future of their country freely and without intimidation." The resolution passed the house on a vote of 405-1. The sole dissenting vote was from the king of isolationism and the friend of liberty Dr. Ron Paul. Senators McCain and Lieberman are considering introducing a similar bill in the senate. Replace Atlanta with America and Birmingham with Iran and the quote is very applicable. Let us continue to stand up for freedom everywhere around the globe. A recent Daily Kos poll on the Virginia Gubernatorial election is good news for Bob McDonnell. The poll shows McDonnell leading 45%-44%. When I first saw the news a couple of my first thoughts were the Deeds bounce disappeared quickly, and being up by just 1% in a liberal poll is not bad. However when you analyze the internals, the poll looks even better. McDonnell's favorables continue to be much better than Deeds. His overall favorables are better, he has a 7% favorable lead among independents, and is more favorable among Democrats than Deeds is among Republicans. McDonnell and Deeds also have an essentially equal disapproval rating, 35% and 36% yet double the people have no opinion on Deeds than on McDonnell. That is a lot of people who can be reached out to and educated on who Creigh Deeds really is. Even with all the good news from this poll, it was slanted Democrat. (What a shock fom a Daily Kos poll.) The poll was overpopulated with Democrats and minorities, and predicts Deeds will win NOVA 3-1. Even with a slanted poll, McDonnell still leads. Earlier I posted an announcement from Kate Maxwell about a CRFV volunteer contest. Here are the details on the competition. The CRFV Executive Committee is proud to announce the first Summer Volunteer Contest open to all College Republicans statewide. We have teamed up with the McDonnell Campaign to offer incentives for volunteers who are able to give 10 HOURS of work (door-knocking or phone-banking at a local Victory office) between now and August 1st. Those who complete the most hours will be given individual prizes, including the opportunity to introduce our candidates at local rallies, free access to fundraisers and ticketed events, and much more! All volunteers who meet the minimum 10 hour requirement will be eligible to attend the First Annual CRFV Fall Kick-Off with Bob McDonnell at the end of summer. Music, food, and drinks will be provided, and all guests will have the opportunity to spend time with fellow College Republicans & enjoy a meet and greet with our future governor! A complimentary photo with Bob McDonnell will also be provided. More details to be announced soon, and we are looking forward to providing a great time and a well-earned reward for our most dedicated volunteers. To RSVP, send an email pledging to complete the 10 hour minimum requirement to crfvcontest@gmail.com. Include your name, school, and registered voting address. You will be sent a volunteer time log to record your hours. Pledge today so that we can put together the best event possible! Please join us on our CRFV Wiki Page for updates and information about the CRFV. This tool will will enable you to communicate better with your fellow VA CRs, see what events are happening across the state, and stay informed as to the conditions of the CRFV and its chapters. Let us know about events at your chapter! If you need a list of Victory Centers to volunteer out of, please click here. Back in 1981 when the tyrannical Soviet regime was cracking down on the Polish people, Ronald Reagan publicized a telephone conversation he had with the Pope that contained this line, "Our sympathies are with the people, not the government." Right now, the Iranian people are protesting on the streets of Iran's capital, Tehran – demanding their freedo m, and yet President Barack Obama remains silent. On the campaign trail, Obama constantly stressed the need to employ America's soft power, our moral and diplomatic clout, around the globe. If there was ever a time to expend America's reserves of soft power in the pursuit of freedom, it is now. If our leaders will not stand up to tyranny when it stares us in the face, then we must. While the fight for the future of Iran and peace in the Middle East at large is going on inside Iran, there are things you can do to help the Iranian people. Click here to read the five ways you can take action to help the Iranian people right now! Last Friday when the Iranian people went to the polls to elect a new president, the election was widely seen as a choice between the radical, holocaust-denying incumbent, Mahmoud Ahmadinejad and the reform-minded challenger Mir Hossein Mousavi. The election was thought to be closely contested, and opinion polls leading up to election day showed Mousavi leading the vote. So when the results were announced, mere hours after the polls closed on Friday, showing Ahmadinejad with an unbelievable two-to-one lead over Mousavi, even winning overwhelming in Mousavi’s hometown, people cried fraud. Over the weekend, protesters took to the streets of Tehran and other cities in Iran demonstrating in the largest protests since the 1979 Iranian Revolution. As you read this email Iranian students are risking their lives to protest in the streets, to spread their message via social networking sites like Twitter -- while the mullahs and Revolutionary Guard watch and wait, trying to decide whether to mow them down, make them disappear, or give in to their demands. Meanwhile, the leader of the free world is AWOL. No threats of sanctions. No standing up for the people in the streets. No refusal to recognize the sham government that won via fraud. But Americans can do better. We must. Now is the opportunity to stand with the Iranian freedom fighters. No plans to raise taxes? That answer has too much wiggle room for us. The rest of Mr. McDonnell's answer doesn't make sense, either. The anti-tax-increase pledge is a guaranteed vote-getter. That's why office seekers sign it every election. In what everyone expects will be a razor-thin race, it is strange to give away a real political advantage. This comment by Bob McDonnell seems to have conceded the high ground on taxes. This election gives a good opportunity to debate the merits of high taxes vs. low taxes since Creigh Deeds seems unable to find a tax increase he doesn't like. He even voted to increase the gas tax when gas was at $4.00 a gallon. Instead of taking Deeds head on for raising taxes, our gubernatorial nominee is leaving the possibility of a tax raise open. Which lead Not Larry Sabato to ask the fair question Is Bob McDonnell planning a middle class tax hike? If Bob is open to raising taxes we should find out now which ones he would like to raise. This is ironic because we should be telling our friends and neighbors about the taxes Bob has pledged to cut as we go door knocking this Saturday. This Washington Times oped is only a symptom of a more fundamental problem. There is a fundamental clash going on right now about the nature of campaigns. Should they be about laying out conservative ideas that will win in the district you are from and persuading people to support those ideals, or should they be about "reaching out" to the elusive independents who "decide elections". In this election Bob McDonnell seems to have chosen to ignore his base and reach out to the independents as he seeks to win the governorship of our commonwealth. Ever since February we've been hearing about how Bob is trying to reach out to the middle. He has been talking about green jobs and bipartisanship and ignored the things that inspire people, taxes, guns, and social issues. Running as a conservative is the path to victory, not political destruction. When was the last time the GOP won the top race on the ticket in Virginia? When was the last time the top of the ticket won in Virginia? Just in case you will point out the obvious that 2004 is old history, let me point you to a couple of recent polls. In a poll Gallup took a moth ago it found that a majority of Americans consider themselves pro-life. In another Gallup poll taken about a week ago found that conservatives (not liberals or independents) comprise the largest ideological group in America. The poll found that 40% of Americans consider themselves conservative while 21% consider themselves liberal, and 45% of independents consider themselves conservative. While these were national polls, I would think they would transfer pretty well to Virginia if there were a Virginia poll on these issues. Even if you want to disagree on this, explain how the Marriage Amendment was passed on the same ballot that George Allen lost on, or how Ken Cuccinelli won in Fairfax in 2007 when Republicans were getting defeated everywhere else. Running as a conservative is what has worked in Virginia and what will continue to work. But here’s the key: Being inclusive doesn’t mean going wobbly. It doesn’t mean abandoning our principles. Reagan called them “first principles.” They are our bedrock beliefs. And in a center-right nation, they are the touchstones that will guide us back into the majority. I want Bob McDonnell to win this election, and if he is going to do it he needs to do it by winning on first principles. Bob McDonnell has a record as a fiscal and social conservative. However, he is refusing to run on it this cycle. D.J. McGuire theorizes that the western part of the state votes on social issues while the eastern part of the state votes on taxes. I would tend to concur with this theory. If it is true then Bob McDonnell is refusing to run on the two issues that lead to success in Virginia. Even if Bob wants to refuse to talk about taxes and social issues then give us something inspiring. What is the big idea Bob McDonnell is running on? What are the things Bob will do as governor that people can get excited and enthused about? Bob McDonnell I want you to win. Please inspire your base, and since you seem concerned about polls maybe that will help you raise your 78% support among Republicans. To echo the words of Ronald Reagan, Bob McDonnell please stop running under a banner of pale pastels, but raise the banner of bold colors which make it unmistakably clear where we stand on all the issues troubling the people. I don ‘t know about you, but I am impatient with those Republicans who after the last election rushed into print saying, “We must broaden the base of our party”—when what they meant was to fuzz up and blur even more the differences between ourselves and our opponents. Jody Wagner: I failed, Can I have a Promotion? Just say Yes!! ...to what? So who is Steve Shannon? So how did Creigh Deeds win? Republican Response to the Democrat Primary. Will Lady Justice Remain Blind? Cuccinelli: Thank You-What a Weekend! Another New York Special Election?